This is an excerpt from the "Supply chain visibility: Illuminating the path to responsive, agile operations" by Gregory Braun Senior, vice-president, C3 Solutions. To download the full paper, visit http://info.c3solutions.com/supply-chain-visibility-white-paper. In a single word, supply chain visibility gives you agility. Business operations today move lightning fast: consumers are fickle, e-commerce and omni-channel distribution demand the ability to switch directions instantly. Likewise, global networks expose the business to greater risks of operational disruption. Once upon a time you could review reports monthly—then it was daily—and make a decision based on comparing and contrasting historical data. Now you don't have time to review anything—the data flows in constantly and an algorithm makes a decision for you based on sophisticated business rules and overarching strategies. Let's look at some of the actual business demands that visibility will help you meet. Online is approaching 12 percent of all retail sales in the US and is climbing at a rate of about 15 percent a year. The changes that e-commerce requires of supply chains are immense, from meeting rapidly shifting demand, to ensuring you have the means to fulfill customer orders—whether through home delivery or pick-up—to being able to process returns in a way that satisfies the customer. These challenges break down into so many additional pieces: How do you manage deliveries? Whether outsourced or in-house, you have to contend with scheduling, missed appointments, traffic congestion – all the logistical issues that can make or break a distribution operation. It's a pressure-cooker unless you leverage the technological tools available to collect useable data and act on it. Do you have insight into the upstream sections of your supply chain? Do you know when orders are leaving your offshore supplier's facility? When transportation links are broken, whether by natural disaster, political violence, strikes, port congestion, or trade disputes (to name only a few possibilities), how do you find out? With world trade representing some 31.5 percent of Canada's GDP, and 58 percent globally, doing business in our globalized era means you need insight into activities in far-flung places. If there is a problem on the far side of the world, you need to know about it and must be able to act quickly to find an alternative transport route, or source of supply. Having visibility tools in play can shine a light on the darkest, dirtiest corners of the world and give you a commercial advantage when trouble is brewing. Partly thanks to global trade, supply chains are subject to increasing regulations governing sources of supply, chain of custody and chain of responsibility. You need to be able to prove your crop was produced organically, or that your factory doesn't employ child labor. You need to demonstrate that you are exercising a duty of care in your operations—from one end of your supply chain to the other. Keeping track of all the I's to dot and T's to cross is impossible in a complex operation without technological assistance. Capital assets are not cheap to acquire, and having to explain to senior management why they need replacing before their lifecycle should end, or explaining how you lost others, is not a conversation you want to have. But with large, complex operations, keeping tabs on assets is a challenge. Where ARE your trucks, containers, forklifts, tools and other equipment right now? What are they doing? When were they last maintained? Are they being used efficiently, or are they sitting idle because they are lost or broken? All these questions have answers that can improve efficiency, if you know how to get them. Have you heard? There is a labor shortage. Transportation rates are climbing as a result of the lack of truck drivers and it is hard to find staff to work in your distribution centers. Visibility helps you to use workers more efficiently by enabling accurate dock scheduling, for example. It also makes your company a better place to work, and that translates into lower turnover and higher productivity. Advances in technology are in many ways the driver behind the current state of global commerce. Georgia Tech, which is a leader in supply chain education notes: "Since the 1980s, computer technology has advanced at such a phenomenal rate that it is currently far ahead of the ability of the supply and logistics field to adequately utilize the new technologies." Technology makes e-commerce possible, makes rapid fulfillment a reality and allows for the kind of instant communication that makes a global supply chain function at all. 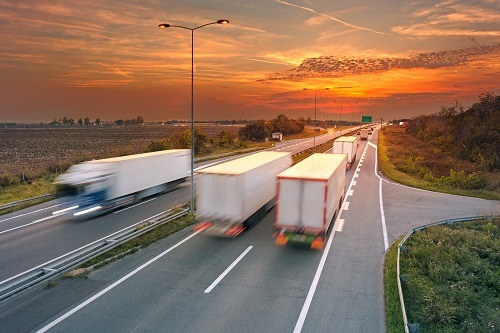 Technologies like cloud computing, web services integration, mobile devices (including smartphones and voice or virtual- or enhanced-reality applications for fulfillment operations), electronic logging for truckers, and sensors that monitor the condition of product in transit are all making for a more competitive logistics environment. Those who lag, resist and stand still are running the risk of being left behind. They will no longer be able to compete in the brave new world if they don't have the tech to make it happen. Early adopters are creating their own supply chain success by leveraging technologies like these to make their operations more efficient. They are putting together the pieces that when fully integrated create the conditions for supply chain visibility. 6. "The Evolution of SCL", Georgia Tech, Supply Chain & Logistics Institute, undated article. https://www.scl.gatech.edu/about/scl/history.